Unusual Silver Tone Ring. This is a really nice silver tone ring but a tough one to describe. You should look at the photo for the design but I can tell you about the finish and that is really great. Very shiny silver and easy to keep that way. Probably from the 1980's. Unmarked. Size 7 PLEASE NOTE PICTURES ARE LARGER THAN ITEMS TO SHOW YOU DETAILS. tHANK YOU. 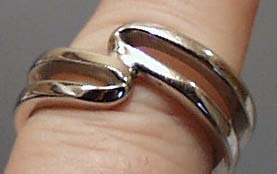 Items Similar To "Unusual Silver Tone Ring"